My Little Pony's horsey fun has been a transitional phase in the development of many youngsters; Hasbro's toy range and the narrative products that accompany them have been popular for over three decades. The current small-screen reboot, known as My Little Pony: Friendship Is Magic, helps generate billion-dollar sales, so the latest cinematic offering sticks with the same creative talent, with a few marquee-name additions to make this outing special. The Friendship Festival of Canterlot is thrown into turmoil by the arrival of ruthless unicorn Tempest Shadow (voiced by Emily Blunt), displacing good-gal heroine Princess Twilight Sparkle (Tara Strong) and her pony friends. While Tempest prepares the way for her master The Storm King (Liev Schreiber) to wreck the place, Twilight and her pals embark on a rescue mission that takes them to the kingdom of the hippogriffs, encountering pirates, feline con-men and other distractions en route. As with 2016's Trolls, Jayson Thiessen's film manages to showcase the commercial brand without sacrificing too much soul; after a rousing introduction to Equestria, featuring a rewritten version of the Go-Go's 80's hit 'We Got the Beat', there's a selection of derivative but passable cod-Disney songs to keep the good-times coming. 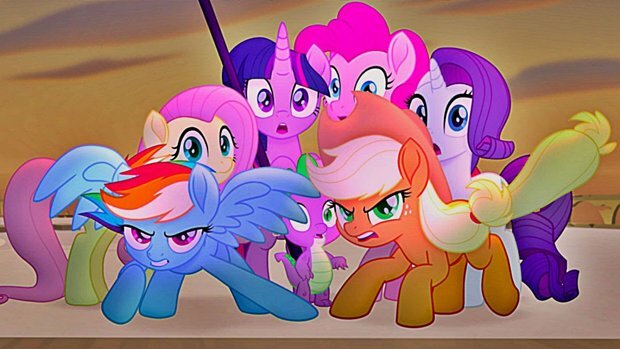 The voice-cast (also including Taye Diggs, Zoe Saldana and Michael Peña) is wildly overqualified, but Blunt seems to be enjoying herself playing a villain, and pop chanteuse Sia cameos, amusingly reimagined as a pony with a heavy fringe. While unlikely to reach beyond a very specific demographic of pre-teen girls, My Little Pony: The Movie is agreeably rendered in easy-on-the-eye 2D animation. It's cute, simple and surefooted enough to deliver a dog-and-pony show that the target audience, at least, are likely to adore. General release from Fri 20 Oct. There are 2 comments on this article — join the conversation.